Description: A ex UP unit waiting to be repaired and painted in CN black and red. 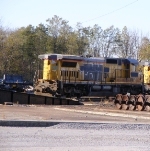 Description: Here we see Ex UP 9098, former CNW 8551 Now CN # 2133 resting next to the office in the Elucid Yard. Photo Taken with permission. Description: Beating me to Winthrop Jct as I take this out the window is CN Engine 2133 with LO40. Description: CN Engine 2133 leads LO40 under the old signal bridge shorty after sunset. Description: CN Engine 2133 Ex UP 9098 leads LO40 back to the Elucid Yard. Description: With a C40-8 in the lead LO40 heads for CN's Elucid Yard. CN 2133 Ex UP 9098. Description: CN Engine 2133 Ex UP 9098 leads LO40 into the Elucid Yard. Now they will make up ther train and head out to Partridge Yard. Description: CN Engine # 2133 Ex UP 9098 runs light back to Elucid Yard. Description: Running light back to Elucid Yard. Description: Light power on its way back to Elucid Yard with a Ex UP C40-8 on point. Description: L540 appraches Baldwin Ave. Description: CN Engine 2133 races across Baldwin Ave with L540 on her way to Partridge Yard. 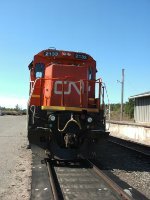 Description: CN Engine 2133 leads L540 past the former Hogan Yard. Description: CN Engine # 2133 Ex UP 9098 leaves Winthrop Jct light. Description: CN Engine # 2133 Ex UP 9098 leaves Winthrop Jct light. At MP 172. Description: CN Engine 2133 leads L540 out of Ishpeming and on towards Partridge yard. Description: To bad the C40 was not the lead unit today. Description: Today we catch one of CN's newly aquared C40's returning back to Elucid Yard. Description: LO40 Crossing Green Wood Street. Description: LO40 heads back to Elucid Yard. Description: CN 2133 leads L540 into Champion, Mi on a rainy afternoon. Description: L540 makes it way up the L'Anse Sub as the last colors of fall hang on. This crossing is actually in the middle of a campground called Michigamme Shores. Description: Through the pouring rain L540 makes it's way up the L'Anse Sub as the last colors of fall hang on. This crossing is actually in the middle of a campground called Michigamme Shores. Description: CN 2133 leads L540 Through The Michigamme Shores Campground and RV park in Champion, Mi on a rainy afternoon. Description: L540 makes it way up the L'Anse Sub as the last colors of fall hit the ground. This photo is actually in the middle of a campground called Michigamme Shores. Description: L540 Charges along near Brown Road at a brisk 10mph. A great speed for chasing trains. Description: CN 2133 A former CNW unit leads today's L540 up the L'Anse Sub at Brown Rd. Description: Rolling West past the little town of Michigamme, Mi.